Spinning the reels of online slot machines is not only extremely fun, they can also provide you with a multimillion jackpot. That’s right, you can become an instant millionaire thanks to stunning titles, like Hall of Gods, Mega Moolah, Mega Fortune and Mega Moolah Isis. Needless to say that those extremely gratifying online slots are available at Royal Panda. Speaking of millionaires, the Mega Fortune slot is themed around financial independence, and features three progressive jackpots. 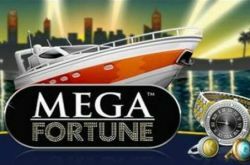 The biggest one, called ‘mega jackpot’, is now worth a staggering $4.3 million, and will continue to swell until someone gets lucky. All three jackpots are available in the bonus mode, which can appear at any given time. Mega Moolah is another online slot that allows you to scoop a life-changing cash prize. This jungle-themed game comes with four progressive jackpots, and the largest one has climbed to more than $2,3 million. Additionally, the Mega Moolah Isis slot is tied to the same network of progressive jackpots. Ancient pharaohs have never been so fun, while the free spins (up to 30) and x6 multiplier are two other ‘interesting’ features. Sign up with Royal Panda, claim your 100% welcome bonus, and start hunting life-changing payouts!